Flying using FPV drone goggles is a terrific experience. To have the best flying experience, it is important to choose the best FPV glasses, which are correct for you. Knowing about field of view, IPD, glass optics, resolution and digital head tracking will help you pick the right drone goggles. A number of drone manufacturers now have their own drone goggles. DJI, Parrot, Walkera And Yuneec now manufacture their own FPV drone goggles. This makes choosing an FPV headset very easy. Now if you own a DJI or Yuneec drone etc, you don’t have to buy their goggles as many drone goggles from the various manufacturers will work on the latest top drones on the market. It is important to fly using the correct drone goggles for your eyes. If you choose an incorrect fitting FPV headset, then you won’t enjoy the experience as much as you should. Most drone goggles on the market now have many adjustable settings and are very comfortable. In this article with videos, we show how to choose the best FPV glasses along with looking at some of the most popular FPV headsets on the market. FPV goggles from Fat Shark, Skyzone, Epson, Oculus, Zeiss, Yuneec and Walkera along with both of the latest DJI FPV goggles. Nearly all the FPV goggles featured in this article can be used for flying drones, watching movies and playing games. If you are new to FPV goggles here are some quick explanations of the technical terms you will come across. To learn more about FPV and video transmission technology, read this terrific article entitled “Drone FPV Video, Antenna Gain And Range” and also this article “What is FPV Camera Technology“. Both articles contain excellent videos. FOV is how much of the world we can see at any given moment. When using optical equipment such as FPV goggles or binoculars, there is always a restriction to what we can see. With FPV goggles, the field of vision (FOV) viewing range is between 25% to 45%. The higher quality and more expensive FPV goggles tend to have a higher FOV. The field of view is a very important aspect to choosing a great FPV goggle. Interpupillary Distance or IPD: This is the distance between the center of the pupils of both your eyes. IPD technology is critical in binoculars and for FPV goggles. Each and everyone one of us is unique and have different shaped faces and distances between our eyes. For the best FPV flying view, it is essential the FPV drone goggles allow for both eye pupils to be positioned within the exit pupils of the goggles. If you buy fixed IPD goggles they may not fit your eyes correctly and the FPV flying experience may not be pleasant. The adjustable IPD is the best option. FPV goggles with head tracking. This technology monitors your head movement and sends these signals to your drone. The camera on your drone follows the same orientation as your head does. If you look up the camera looks up, to the left or to the right the camera follows. It brings a whole new experience to drone flying. It’s a tremendous experience and gives you much more flexibility. Most FPV goggles now incorporate digital head tracking. Depending on the FPV headset you purchase, you will more than likely need to also buy a Receiver Module. These Receiver Modules are available in 1.3 GHz, 2.4 GHz, or 5.8 GHz options. It is best to read the manual or instructions regarding compatibility between your FPV headset and receiver module. For example with the Dominator V3, Fat Shark only guarantees compatibility with NexwaveRF modules. The receiver modules are easy to install. Generally you need to simply remove a door panel on the side of the FPV headset, insert the module, and snap the door panel back in place. Here is an excellent YouTube video which explains all about extending FPV antennae range and gain. Here’s a few quality manufacturers and suppliers of FPV goggles. View can view an even more comprehensive list of top FPV drone goggles here. Choose an FPV goggle with an FOV of at least 35%, adjustable IPD, VGA or SVGA resolution, glass optics and digital head tracking. If you have a Walkera drone, they manufacture FPV goggles for their own range. It is always a great idea to check the website of your drone to see if they recommend a particular FPV goggle. They may have tested various brands for their drones. Buy the best FPV goggles you can afford as the experience will be well worth it. If you buy the wrong FPV goggle, you won’t enjoy the experience one bit. Which would be a real shame. With DJI having something like 70% of the consumer drone market, it took DJI a long time to release their own FPV drone goggle. They now have 2 drone goggles on the market. A standard and a racing edition. 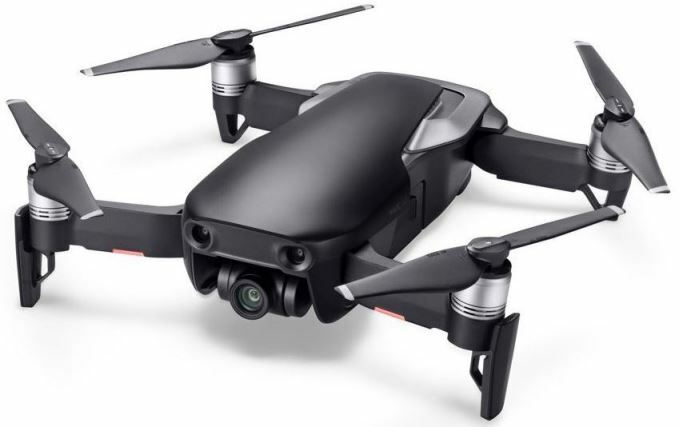 The racing edition will work with other drones so not just DJI drones. We will look at both of these first and then some of the others. The DJI Goggles Racing Edition (RE) have a cool matte black visor and headband, along with padding covered by high-quality red leather. These DJI RE goggles are designed and engineered for racing and are compatible with an OcuSync video transmission module and a high-performance camera module. These work together to transmit digital video signal from up to 7 km away with latency as low as 50 milliseconds in addition to analog signal. 12 Transmission Channels – Access to low-interference transmission channels which is ideal for FPV drone racing. Automatic FHSS Technology – If their is wireless interference, the OcuSync Module will automatically switch between the 2.4 and 5.8 GHz channels to maintain unobstructed transmission. Connect a 2nd Pair of DJI Goggles – A spectator can experience the thrill of drone racing from the same perspective as the pilot. Analog Transmission – The analog transmission is via the SMA port. Other Drones – By connecting a third-party controller to the Goggles, users can directly control racing drones with an F3, F4, KISS, Naze, or other supported flight controller. Gimbal Control – In head tracking gimbal mode, a user can control the gimbal camera just by putting on the Goggles and turning your head. On Screen Display – Essential flight information, including transmission resolution, battery level,and signal quality, is easily visible on screen. Multiple Antenna – DJI Goggles can be purchased with a set of three external antennas for different scenarios. Video – These DJI Goggles play videos in a variety of different formats, including MP4, MOV, MKV and Users can also view 6K 360-degree panoramas. The OcuSync Camera uses a 1/3 inch image sensor, giving a much higher-resolution video transmission than most analog FPV goggles on the market. It also has a global shutter, significantly reducing rolling shutter effect caused by high-frequency vibration. Also, its 148° FOV with a low-distortion lens delivers a wide, yet natural-looking camera view. With such an advanced camera, users can control flight accurately and even record a whole flight for analysis or sharing. The big names in FPV goggles are Fat Shark, Oculus, Epson, SkyZone and Zeiss with their VR One Plus multimedia video glasses. There is big money investing in FPV technology and we are seeing incredible innovation every few months with FPV glasses. One of the companies who is investing big in FPV goggles is Oculus and the last video below is an interview with Oculus founder Paul Luckey. One of the best FPV goggles, which work with the DJI drones is the Moverio BT-300 FPV smart glasses. These FPV goggles redefine First Person View technology, with a transparent display, which make it very easy to view your drone’s video feed and key flight statistics, while keeping the UAV in sight. The Moverio BT-300 FPV innovative display delivers real time footage, which doesn’t block your view. This helps to ensure a safe, distraction free flight experience. The Moverio is one of the few 3rd party accessories which DJI endorse. This FPV goggle is ultra light and comfortable. In fact, DJI and Epson released a video featuring the Moverio BT-300 FPV goggles being used by Fire Fighters along with the Mavic 2 Enterprise drone to assist them in saving lives. View the DJI / Epson Moverio BT-300 new tools video. 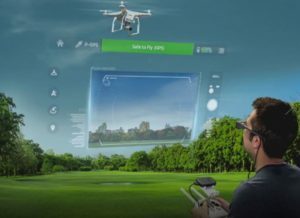 Maintain a clear line of sight — transparent display allows drone pilots to see key flight statistics, while still maintaining visual line of sight with the drone. Premier FPV DJI partner — controller comes preloaded with the DJI GO App. Easily record your drone in flight — front-facing camera captures realtime 1080p footage (at 30 fps) of your drone in flight, from the pilot’s view. Light, comfortable fit — world’s lightest Si-OLED-powered, binocular, transparent smart glasses, only 2.5 oz/69 grams; easy to wear, even for extended periods of time. Good visibility in bright sunlight — includes an extra dark shade so there’s no need for a hood allowing you to maintain visual line of sight with your drone, even in sunny environments. Custom clips to hold the controller in place — securely holds the BT-300 FPV controller to the DJI remote. Prescription glasses friendly — fits over a wide range of prescription eye wear. Built-in card slot — supports removable microSDHC cards up to 32 GB. Future-ready — motion sensors, front-facing high-resolution camera and the ability to render 3D content will enable developers to build next-generation flight experiences. The Epson Moverio BT-300 FPV is the perfect goggle for a terrific flying experience. These goggles will also work with a few other drones which are highlighted in the below goggle review video. Battery Life – Approximately 6 hours. Camera – 5 million pixels. Sensors – GPS/geomagnetic sensor/accelerometer sensor/gyroscopic sensor/ambient light sensor. Bluetooth – V4.1 (Bluetooth Smart Ready Class2). Panel Size – 0.43 inches (wide panel 16:9). Panel Pixel Count – 921,600 (1280 x 720) x 3. Diagonal Angle Of View – approximately 23 degrees. Virtual Screen Size – 40 inch support (virtual viewing distance 8.2 feet (2.5 meters). Color Resolution – 24 bit (16.7 million colors). Supported Moved Formats – MP4 (MPEG-4/H.264+AAC), MPEG-2 (H.264+AAC), VP8. Supported Still Image Formats – JPEG, PNG, BMP, GIF. Supported Audio Formats – WAV, MP3, AAC. Internal Memory – Main memory 2 GB and 16 GB user memory. The Moverio BT-300 FPV price is excellent value because it is perhaps the best FPV glasses on the market. It is well ahead of many of the other goggles on the market and is perfect for DJI drones. Next is a thorough review of the fantastic Epson Moverio BT-300 smart FPV glasses. 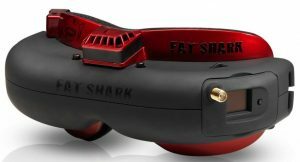 The Fat Shark FPV goggles are the most popular brand on the market with years of expertise in this sector. Their FPV goggles have great optics and no edge blur with zero light-intrusion. The top contestants in the Drone Racing League are all using Fatshark goggles. They presently have 14 FPV glasses in their range and the below 3 are perhaps the best FPV drone goggles. FSV1076 Dominator HD3 Core – 42º FOV, Plastic Optics, SVGA 800 X 600 resolution, Adjustable IPD 59 to 69 mm, Polarized LED backlight. 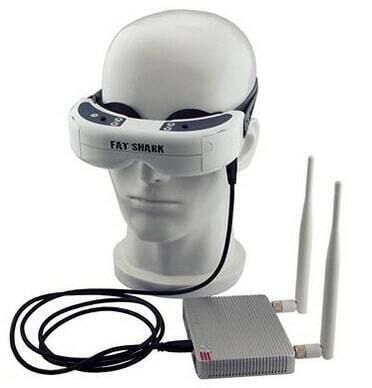 Visit the Fat Shark headset page as they have a impressive selection of FPV goggles. Here is a terrific video which compares the various Fat Shark FPV goggles. The SKY03 3D FPV goggles are pretty impressive. Here is a quick look at it’s features. ISM 5.8 GHz 48 channel diversity receiver with dual antennas meaning the receiving signal is more stable and fast. Support HDMI, DVR, AV in / out. Built with front camera which enable you to observe surroundings very easily without taking off the goggles. Up to 43 degrees FOV. Binocular display, SVGA 800 x 600 resolution gives you an excellent experience. Intimate design with high-comfort facial sponge giving a soft and comfortable feel. Built-in heat-sink fan to prevent fogging. Here is a quick introduction to the Skyzone SKY03 3D goggles. Walkera Technology produce a range of very innovative and high tech drones including the Voyager 3, QR X800, Tali H500 and X4 Scout Drones. They also produce 2 top racing drones. The great thing about Walkera is that they also produce their own range of FPV goggles specifically for their drones. Their latest FPV glasses is the Walkera Goggle 4 and are perfect for their full range of racing drones. The Eachine EV800 is incredible popular and is tremendous value for money. The EV800D has 6 Leaf RCHP 5 dBi antenna and also a 16 dBi Panel antenna along with a built-in 5.8 GHz 40 channel diversity receiver, meaning the live video signal will automatically switch to the best antenna. 5 Inch HD high brightness LCD specially tuned for FPV racing. Super-wide FOV visible angle up to 82º. 40 channel auto searching diversity race band. Built-in super HD DVR which can record up to 720 x 576 resolution. Two system (Display/Record duo core separated chipsets ) which ensure no delay in displaying and no frame lost in recording. 92% transparent lens adopted, no distort, no blur on the edge of screen. This Yuneec SkyView FPV headset is compatible with Typhoon H, Typhoon Q500 4k and Tornado H920 drones. 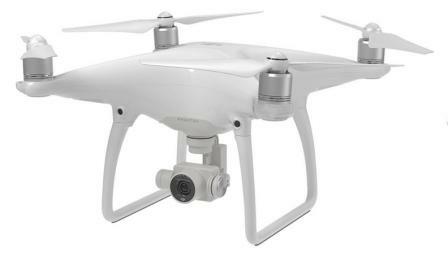 As you operate the camera, you will see exactly what the drone sees, as if you were on board. The Yuneec FPV goggles were designed to be ergonomic and durable with an adjustable headband which will accommodate users who wear glasses. The Skyview headset is equipped with a USB port for fast charging, and has a HDMI port to connect any HDMI devices so you can use these goggles to watch movies, play video games and more. The HDMI cable can also be used to transmit sound to the goggles. Here’s a nice aerial flight with the Yuneec Q500 4k with the pilot wearing the SkyView goggles. CinemizerOLED video glasses have super clear lens and really give you tremendous immersive experiences. They are so perfect for flying your drone. When you are not flying your drone, then the CinemizerOLED will give you an absolutely fantastic high definition cinema like experience sessions when connected to your phone, gaming console or TV box. The 40 inch simulated screen, with 2 high resolution OLED displays with record breaking density of pixel. The CinemizerOLED has a 6 hour battery life making it perfect for everything from drone racing to enjoying watching movies, TV and playing games on your console. You can read a full article on the CinemizerOLED glasses for drones here. This short videos shows you around the elegant and sophisticated CinemizerOLED FPV glasses. This FPV Goggle is quiet functional with its 854*480 resolution display screen to ensure a high quality image and it has a great feature of recording video with installed SD card (not included). It will give you a excellent fly visual experience. Here is an terrific introduction to the BOSCAM GS922 drone goggles. The below video takes a look at the Oculus Rift which was first on view at CES 2016. It’s a quick interview with Oculus founder Palmer Luckey which talks about the Oculus headset, Oculus Touch and Oculus Home software. Rift uses state of the art displays and optics designed specifically for virtual reality. Its high refresh rate and low-persistence display work together with its custom optics system to provide incredible visual fidelity and an immersive, wide field of view. This next video shows you the Oculus Rift been used for FPV drone flying with the Parrot Bebop drone and Sky Controller. The Samsung Gear VR is an exception goggle. It has a super AMOLED display, wide field of view, precise head-tracking and with low latency it brings reality to the virtual. The Samsung Gear VR works seamlessly with Galaxy smartphones. All you need to do is slip in your phone and you’re free to take on the world and beyond. To reach new levels, a comfortable headset is a must. That’s why with a wider interface, the Samsung Gear VR is now 19% lighter compared to the previous model and with its larger touchpad, you get easy and accurate control. The Samsung GEAR is a tremendous goggle and it is also excellent value. Check out the Samsung GEAR VR price. Here is a instructional video on how to connect the Samsung GEAR VR and have it working with a DJI Phantom 4 quadcopter.